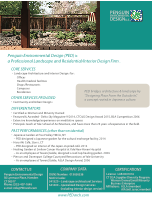 Penguin Environmental Design (PED) is a professional landscape and residential design firm located in Hamden, Connecticut. PED bridges architecture and landscape by “designing place from the outside in”, a concept rooted in Japanese culture. PED especially cherishes small projects: new constructions or remodeling of houses, gardens, and small commercial spaces. We also take on a wide variety of projects: parks, public art works in commercial, institutional, and health facilities, urban design projects, and urban studies. PED designs place from the outside in. We believe that place, as united entity of architecture and landscape, should be designed as a part of its outside: its surrounding society and natural environment. Its outside always keeps changing. And place must breathe with it. To accomplish this, PED creates conversation between either side of a building surface, and hence, between the outside and human-beings who live inside. The conversation is always visual through our choice of colors, materials, and objects. It is often physical for human body, because elements that we design encourage you to travel between the outside and inside. Conversations that we compose are also meditative. PED’s knowledge on Japanese garden and architecture allows us to make serene environment in which you can become one with nature. PED’s a touch of Since modern designs were historically much influenced by Japanese culture, Japan-ness naturally blends in to the contemporary feeling in PED’s works.